Wendy's Kiboshes Unofficial Nine-Patty "T-Rex Burger"
The Wendy's restaurant in Brandon, Manitoba stopped selling a nine-patty "T-Rex burger" after word of the thing got out on Reddit. 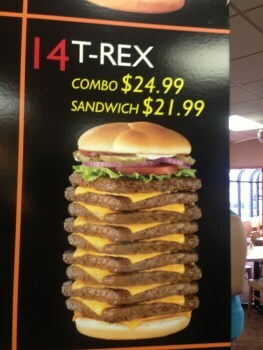 Until very recently you could walk into the local Wendy's in Brandon, Manitoba, and order a T-Rex burger, a $21.99 monster - $24.99 if you wanted the combo - that squeezed nine quarter-pound burger patties and nine slices of processed cheese between two greasy buns to create a 3000-calorie, artery-clogging, heart-stopping gastronomic nightmare with 200 grams of fat and 6000 - that's right, six thousand - milligrams of sodium. The burger apparently had its roots in a joke ad that ran nine years ago in Sports Illustrated, but a few customers actually asked for it and the restaurant, which allows people to add extra patties to their burgers for a fee anyway, decided to go along with it. They were popular enough, reportedly selling two or three a day, that the restaurant eventually added it to the menu as the T-Rex burger. All was well until word of the beast got out on Reddit, after which the restaurant quickly shut it down. "For obvious reasons, Wendy's of Brandon neither condones nor promotes the idea of anyone consuming a nine-patty burger in one sitting," administrative assistant Barb Barker read from a prepared statement. Wendy's "strives to deliver a positive dining experience for our customers. Our goal is to provide options to our customers so they can make options that meet their needs," she added. It's not clear whether the restaurant decided to pull the plug on its own, or if it was directed to do so by upper management. It's a sad conclusion either way, especially since I don't see how the T-Rex burger fails to fit Wendy's goal of creating a "positive dining experience." After all, if they offered them around here, I'm positive I'd order one.